System which protects the driver and front passenger in the event of a serious front impact in order to limit the risk of injury to the head and thorax. The driver's airbag is fitted in the centre of the steering wheel; the front passenger's airbag is fitted in the dashboard above the glove box. The airbags are deployed simultaneously, unless the passenger's front airbag is deactivated, in the event of a serious front impact to all or part of the front impact zone A, in the longitudinal centreline of the vehicle on a horizontal plane and directed from the front to the rear of the vehicle. The front airbag inflates between the thorax and head of the front occupant of the vehicle and the steering wheel, driver's side, and the dashboard, passenger's side to cushion their forward movement. then, remove the key keeping the switch in the new position. This warning lamp comes on in the instrument panel when the ignition is on and until the airbag is reactivated. To assure the safety of your child, the passenger's front airbag must be deactivated when you install a "rear facing" child seat on the front passenger seat. Otherwise, the child would risk being seriously injured or killed if the airbag were deployed. When you remove the child seat, with the ignition on , turn the switch to the "ON" position to reactivate the airbag and so assure the safety of your front passenger in the event of an impact. If this warning lamp comes on in the instrument panel, accompanied by an audible warning and a message in the screen, contact a PEUGEOT dealer or a qualified workshop to have the system checked. The airbags may no longer be deployed in the event of a serious impact. 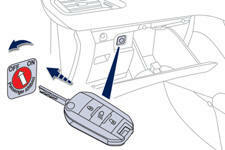 If this warning lamp flashes, contact a PEUGEOT dealer or a qualified workshop. The passenger's front airbag may no longer be deployed in the event of a serious impact. If even one of the two airbag warning lamps comes on continuously, do not install a child seat on the front passenger seat. Have it checked by a PEUGEOT dealer or qualified workshop.